The Big Bang theory is the prevailing cosmological model, that explains the early development of the Universe. According to the Big Bang theory, the Universe was once in an extremely hot and dense state which expanded rapidly. This rapid expansion caused the young Universe to cool and resulted in its present continuously expanding state. According to the most recent measurements and observations, this original state existed approximately 13.7 billion years ago, which is considered the age of the Universe and the time the Big Bang occurred. After its initial expansion from a singularity, the Universe cooled sufficiently to allow energy to be converted into various subatomic particles. Fred Hoyle, BBC radio broadcast, 1949. Reprinted in April 1949 in The Listener. The main efforts of investigators have been in papering over contradictions in the big bang theory, to build up an idea which has become ever more complex and cumbersome. Fred Hoyle, The Intelligent Universe. Fred Hoyle, The Intelligent Universe, Page 186. In the beginning there was an explosion ("expansion"). Not an explosion like those familiar on earth, starting from a definite center and spreading out to engulf more and more of the circumambient air, but an explosion which occurred simultaneously everywhere, filling all space from the beginning, with every particle of matter rushing apart from every other particle. ‘All space’ in this context may mean either all of an infinite universe, or all of a finite universe which curves back on itself like the surface of a sphere. Neither possibility is easy to comprehend, but this will not get in our way; it matters hardly at all in the early universe whether space is finite or infinite. At about one-hundredth of a second, the earliest time about which we can speak with any confidence, the temperature of the universe was about a hundred thousand million (1011) degrees Centigrade. This is much hotter than in the center of even the hottest star, so hot, in fact, that none of the components of ordinary matter, molecules, or atoms, or even the nuclei of atoms, could have held together. Instead, the matter rushing apart in this explosion consisted of various types of the so-called elementary particles, which are the subject of modern high­energy nuclear physics. Steven Weinberg The First Three Minutes: A Modern View of the Origin of the Universe (1977), 5. Bothers science because it clashes with scientific religion—the religion of cause and effect, the belief that every effect has a cause. Now we find that the biggest effect of all, the birth of the universe, violates this article of faith. . . . what came before the Big Bang is the most interesting question of all. The director of the U.S. National Aeronautics and Space Administration’s Goddard Institute for Space Studies in 1979. To admit such possibilities seems senseless to me. Albert Einstein, quoted in the article Does God Really Exist?, in The Watchtower magazine, february 15, 1981. This circumstance of an expanding universe is irritating. Albert Einstein, quoted in the article Does God Really Exist?, in The Watchtower magazine, published by Jehovah's Witnesses, february 15, 1981. Theologians are delighted that the astronomical evidence leads to a biblical view of Genesis—but curiously, astronomers are upset. Robert Jastrow, quoted in the article Does God Really Exist?, in The Watchtower magazine, published by Jehovah's Witnesses, february 15, 1981. Ten or twenty billion years ago, something happened—the Big Bang, the event that began our universe. Why it happened is the greatest mystery... That it happened is reasonably clear. All the matter in the universe was concentrated at extremely high density—a kind of cosmic egg, reminiscent of the creation myths of many cultures—perhaps into a mathematical point with no dimensions at all. The discovery of the Big Bang and the recession of the galaxies came from a commonplace of nature called the Doppler effect. ...An object approaching us at very high velocities is perceive to have the color of its spectral lines blue-shifted. An object receding from us at very high velocities has its spectral lines red-shifted. ...Following a lead by the astronomer V. M. Slipher... Humason and Hubble found, to their amazement, that the spectra of all distant galaxies are red-shifted. The first, and main, problem is the very existence of the big bang. Andrei Linde, quoted in the article The Awesome Universe; What the Big Bang Explains—What It Doesn’t, in the Awake! magazine, January 22, 1996. One may wonder, What came before? If space-time did not exist then, how could everything appear from nothing? . . . Explaining this initial singularity—where and when it all began—still remains the most intractable problem of modern cosmology. [Big Bang theory] suggested that matter and motion originated rather as Genesis [in the Bible] suggests, ex nihilo, out of nothing, in a stupendous explosion of light and energy. Newsweek magazine of November 9, 1998. The forces loosed were—are—remarkably (miraculously?) balanced: If the Big Bang had been slightly less violent, the expansion of the universe would have been less rapid, and would soon (in a few million years, or a few minutes—in any case, soon) have collapsed back on itself. If the explosion had been slightly more violent, the universe might have dispersed into a soup too thin to aggregate into stars. The odds against us were—this is just the right word—astronomical. The ratio of matter and energy to the volume of space at the Big Bang must have been within about one quadrillionth of 1 percent of ideal. Take but degree away (see above, the one quadrillionth of 1 percent margin for error), . . . and what follows is not just discord but eternal entropy and ice. So, what—who?—was the great Tuner? The big bang theory does not describe the birth of the universe … Another theory describing even earlier times will be needed to explain the original creation of the universe. Reported in its January 1999 issue the magazine Scientific American. Many scientists did not like the idea that the universe had a beginning, a moment of creation. Stephen Hawking, quoted in the article Did It Really Have a Beginning?, in the Awake! magazine, June 22, 1999. The ideas that prove to be of lasting interest are likely to build on the framework of the now standard world picture, the hot big bang model of the expanding universe. The full extent and richness of this picture is not as well understood as I think it ought to be, even among those making some of the most stimulating contributions to the flow of ideas. Once we overcome our fear of being tiny, we find ourselves on the threshold of a vast and awesome Universe that utterly dwarfs—in time, in space, and in potential—the tidy anthropocentric proscenium of our ancestors. We gaze across billions of light-years of space to view the Universe shortly after the Big Bang, and plumb the fine structure of matter. We peer down into the core of our planet, and the blazing interior of our star. We read the genetic language in which is written the diverse skills and propensities of every being on Earth. We uncover hidden chapters in the record of our origins, and with some anguish better understand our nature and prospects. We invent and refine agriculture, without which almost all of us would starve to death. We create medicines and vaccines that save the lives of billions. We communicate at the speed of light, and whip around the Earth in an hour and a half. We have sent dozens of ships to more than seventy worlds, and four spacecraft to the stars. We are right to rejoice in our accomplishments, to be proud that our species has been able to see so far, and to judge our merit in part by the very science that has so deflated our pretensions. It is true that physicists hope to look behind the ‘big bang,’ and possibly to explain the origin of our universe as, for example, a type of fluctuation. But then, of what is it a fluctuation and how did this in turn begin to exist? In my view, the question of origin seems always left unanswered if we explore from a scientific view alone. Charles H. Townes, quoted in the article Did It Just Happen, or Was It Created? in the Awake! magazine, June 22, 1999. David H. Clark & Matthew D. H. Clark, in Measuring the Cosmos: How Scientists Discovered the Dimensions of the Universe (2004). The big bang was not an explosion in space; it was more like an explosion of space. The big bang happened everywhere. It was not a bomb going off at a particular spot that we can identify as the center of the explosion. We are privileged to be part of the first generation who can claim to have a respectable, rational, and coherent description for the creation and evolution of the universe. The Big Bang model offers an elegant explanation of the origin of everything we see in the night sky, making it one of the greatest achievements of the human intellect and spirit. It is the consequence of an insatiable curiosity, a fabulous imagination, acute observation and ruthless logic. 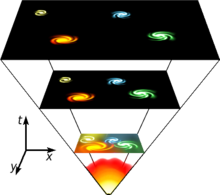 Even more wonderful is that the Big Bang model can be understood by everyone. Tom Utley quoted in the article How Did the Universe and Life Originate?, in the Awake! magazine, June 8, 2002.